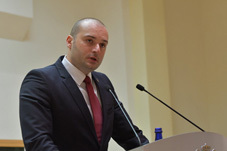 Members of the European Parliament asked a question to Georgian Prime Minister Mamuka Bakhtadze regarding the case and the arrest of one of the most influential figures of the United National Movement government Vano Merabishvili, who served as Interior and Prime Minister under the previous state leadership. “We are concerned about former Interior Minister Vano Merabishvili’s case. How will this issue be solved? – MEP Joseph O'Reilly, asked Prime Minister Mamuka Bakhtadze while in PACE on Wednesday. "Georgia has made good progress after the Rose Revolution, including in the field of human rights. The European Court of Human Rights found the violation of Article 18 of the Convention in relation to him. How will this issue be solved? "- added the MEP. Bakhtadze responded that Merabishvili was arrested on several criminal charges. “The Committee of Ministers of the Council of Europe is overseeing the execution of the judgment of the European Court of Human Rights, and of course, we are fulfilling our obligations. Let me repeat once again - Merabishvili was arrested on several criminal charges," Bakhtadze told the PACE member. The European Court of Human Rights (ECtHR) released a statement about the case which concerns the application of Merabishvili against the Government of Georgia in 2016. The Court stated that the official's pre-trial detention was fair. “The pre-trial detention of former PM of Georgia was lawful and based on reasonable grounds,” the ECtHR wrote. Merabishvili was arrested in May 2013 after the current ruling Georgian Dream (GD) coalition defeated the previous leading power, the United National Movement (UNM) party, in the 2012 parliamentary race. Merabishvili was charged for faking documents, misspending budgetary funds and alleged exceeding his power in connection with three different notorious cases. In February 2014, a Georgian court found Merabishvili guilty on the charge of exceeding his official power and he was sentenced to four years and six months in prison. The applicant alleged that his pre-trial detention had not been governed by clear legal rules and had been unreasonable. Merabishvili also claimed his pre-trial detention served the purpose of excluding him from the political life of the country, as he was appointed Secretary General of the UNM after the 2012 parliamentary elections and intended to participate in the 2013 Presidential elections. “The Court concludes that there has been no violation in this regard,” the Court stated regarding his claims. However, the Court said one of the decisions of the Georgian Court that concerned the replacement of pre-trial detention with bail could be considered a violation of the law, as a judge orally and in a very short period of time announced the decision. “The Court concludes that, when confirming the applicant’s detention on 25 September 2013 on the basis of a single abstract phrase pronounced orally – ‘the request for the cancellation of the pre-trial detention should be rejected’ – the Tbilisi City Court acted in contradiction to its heightened obligation, which followed from the lapse in time since the initial authorization of the detention measure, to establish convincingly the existence of new concrete facts justifying the continued detention of Merabishvili and to consider alternative non-custodial pre-trial restraint measures. “That superficial manner of the judicial review of the reasonableness of the deprivation of the applicant’s liberty constituted a particularly broad restriction of the latter’s rights,” the Court wrote. The Court also held that Georgia was to pay Merabishvili 4,000 euros (EUR) in respect of non-pecuniary damage and EUR 8,000 for costs and expenses. “However, the European Court of Human Rights confirmed Georgian judges made a fair decision about the pre-trial detention,” Minister of Justice Thea Tsulukiani said. "We are very pleased that the Court clearly said that Merabishvili's pre-trial detention, which began in May 2013 and ended in February 2014, was lawful. Also, the Court found that the first two decisions concerning the pre-trial detention adopted by the Georgian judges were well-founded, the Minister added. However, Tsulukiani said the issue of compensation would be appealed by her.